The adult brown dog tick is reddish-brown and lacks any ornamentation. They are 1/8 – 3/16″ in length. Larva have six legs, while nymphs and adults have eight legs. When fully fed, the body stretches and changes from reddish-brown to a more blue-gray. Females increase in size dramatically when engorged from feeding, while males only stop take small meals and don’t get as large. Brown dog ticks are most commonly found in warmer climates. However, they can complete their entire lifecycle indoors, so they are found in colder climates as well. 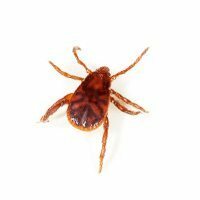 Usually a dog will bring a few ticks into a home or kennel when they have been out of the house. An infestation can take place quickly. Larva and nymphs typically attach to a dog’s back, while adult ticks usually attach on the ears and between a dog’s toes. Ticks feed on the blood of their host. Brown dogs ticks prefer dogs over anything else, but will also feed on other domestic animals, rodents, and rarely humans. 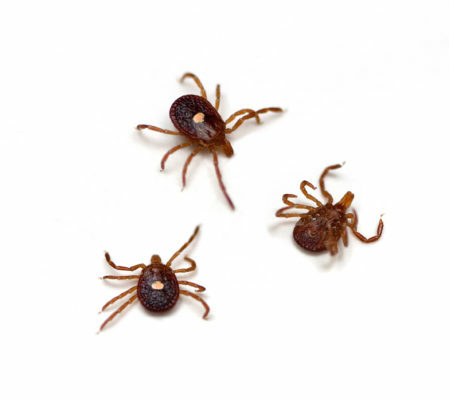 The brown dog tick is a 3-host tick, meaning it needs three hosts to complete development, and leaves each host to develop and molt between stages. The three stages of life are larva, nymph, and adult. If a brown tick completes its lifecycle indoors and in one house, this might mean feeding on the same dog three times. Feeding and development times are usually faster at higher temperatures. The cycle can be completed in just over two months, but can take longer due to few hosts or colder temperatures. An adult female feeds on her host for about a week, then drops off to find a secluded place for egg development. Cracks and crevices are preferred places. She then lays up to 1,000-5,000 eggs over four days. After she finishes laying the eggs, she dies. The eggs hatch 2-5 weeks later. 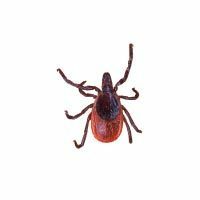 Ticks can live several months in each stage without feeding, and adults can live up to 18 months without feeding. 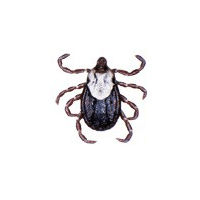 Male ticks feed on blood as well, but for much shorter periods of time.